Check out our range of fun mice facts for kids. Learn about what their whiskers are for, what a mouse eats, how many species of mice there are and much more. Read on and enjoy our interesting information about mice. A mouse or plural mice is a small mammal from the rodent order of animals. Mice have a pointed snout, small rounded ears, and a long almost hairless tail. 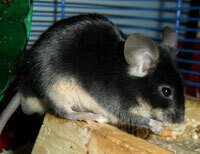 The house mouse is the best known type of mouse and is a popular pet variety. Other mouse species seen in and around the house are the field mouse, the American white-footed mouse and the deer mouse. Mice tails can grow as long as their bodies. Mice use their whiskers to sense changes in temperature and to help feel the surface they are walking along. Mice build very complex burrows with long entrances and many escape routes. They are very clean and tidy rodents with their burrows often having separate areas for storing food, sleeping and going to the toilet. The mouse is a delicacy in eastern Zambia and northern Malawi, where they are eaten as a source of protein. Because they have so many predators mice usually only live for about six months in the wild. In a lab or as a pet they can live for up to two years. In 1928, Walt Disney's Micky Mouse was the first mouse character to be used in children cartoons and animation. Mouse characters have remained popular since with other such as Speedy Gonzales, Jerry from Tom and Jerry, and Stuart Little.